The people, goods and data streaming through the Rhine-Main Region every day leave traces all across the globe. Through the medium of video they can be tracked – with different artistic approaches – as biographic, political, economic or cultural testimonials of the region in the world. This competition is primarily but not exclusively addressed to artists, who are linked to the region, be it because they live or work here, that they live in one of the partner cities or regions of the Rhine-Main Region (e.g. Birmingham, Budapest, Dubai, Granada / Nicaragua, Guanzhou (Kanton) / China, Kairo, Krakau, Leipzig, Lyon, Mailand, Tel Aviv – Yafo, Toronto), or are or have been students of a partner university. 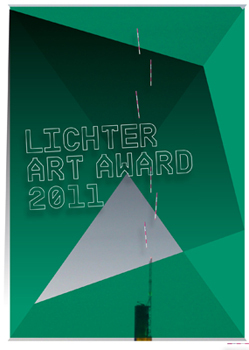 The winner artist will be invited to the festival and will receive the LICHTER ART AWARD which is endowed with a 1.000 Euros prize. The film or video works – as projected loop or room installation – will be presented throughout the festival period in the immediate vicinity of the festival centre. The concept proposal must arrive by January 8, 2011. Check terms & conditions for participation.